Magic Johnson and the Los Angeles Lakers remain in contact with the New Orleans Pelicans in trade talks for All Star center Anthony Davis as they race to beat the clock ahead of Thursday's 3pm NBA trade deadline. 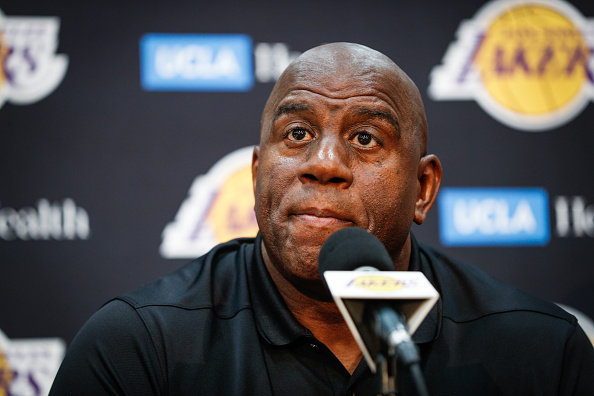 As of yesterday, the Lakers were reportedly prepared to give up multiple draft picks and salary cap relief, in addition to several young players, in an effort to get the Davis deal done before Thursday at 3pm ET. For example, Lakers reporter Brad Turner says the Lakers are willing to give New Orleans cap relief for Davis by taking Solomon Hill for Lonzo Ball, Kyle Kuzma, Brandon Ingram, Rajon Rondo, Lance Stephenson, Michael Beasley, and two 1st round picks. However, it doesn't appear the Pelicans were too enthusiastic about that offer. "So far, the Lakers have felt that conversations with New Orleans have been one-sided, and they are growing increasingly pessimistic about the Pelicans' willingness to make a deal with them, sources with knowledge of the discussions told ESPN's Ramona Shelburne." Needless to say, the Lakers are "growing increasingly pessimistic" they'll be able to complete a deal for AD before the deadline, according to ESPN's Ramona Shelburne.